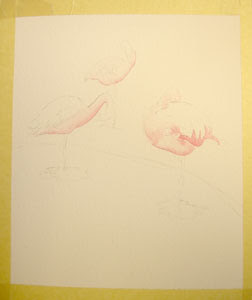 in very wet washes to lay down the first bits of pink colors in the flamingos. This helps to establish the focal point and to give you a sense of satisfaction, that, yes, you have started your painting! Try some different pinks and reds from your palette on a scrap piece of watercolor paper to see which colors on your palette will make the right color for your painting. 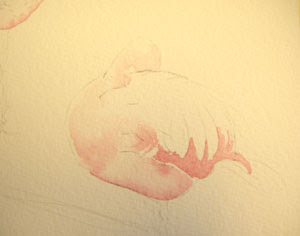 This is a detail shot of one of the flamingos. You can see that the application of paint is not fussy, just quickly lay down some bits of wet color. If your pigment is wet enough, you will be able to siphon off areas that may have too much color.